God’s knowledge of Isaiah from before birth. Isaiah’s sense of calling. Recorded music You are the light of the world (Pino) This is a lovely catchy refrain, which we have sung once before; if you have the CD you could play it. If not, and you have a clever musician, they could work out the chords (we did!). It's not directly based on this reading but I think it would be great. Here's one version. Good for kids (if you sing it) . Online resource Let me be your light to the nations (Grundy) A simple refrain, that would work well, particularly if you are reflecting on gun-related violence or war. Sound sample and link to free sheet music. *Worldmaking.net God of My Breathing (Bruxvoort-Colligan). Excellent words to a well-known hymn tune (BUNESSAN). Sample and lyrics. New words to old tunes. Tune In: God’s Mercy (Anderson) A beautiful ballad about recognising God's mercy in the everyday. Lyrics, sound sample, songbook. Emergent Psalter You are my help and my rescuer (Everett) A simple and lovely Psalm refrain to Psalm 40. Sample sheet music. You can also alternate between these two refrains as described in the book. Recorded Music 40 (U2) This classic song from U2 is based on Psalm 40 and would be good to include in a worship service. Thanks to Peter Champion for this suggestion. Youtube. *Iona (Common Ground, Ps PPP) / CH31 / GtG651 / PfAS040B / URW266 I waited patiently for God (Bell) Surprisingly positive for such a gloomy Psalm (Psalm 40). Lyrics. Can be sung to NEW BRITAIN / AMAZING GRACE as well, but can also be sung to the William Billings tune LEWIS-TOWN. New words to old tunes. *Iona (M&G) / CH267 / StB264 Blest be God blest be God for ever (Martinez / DANDASOY) Beautiful words to a beautiful, but tricky Philippino melody (unless you have a Philippino congregation, in which case it's just a familiar folk tune). This would be great to ask a small group to sing if you have some good singers in your congregation. Works especially nicely with a guitar. Cha740a God your mercy is upon us as we place our trust in you Responsive psalm with joyous sung refrain to a familiar hymn tune. SP&P155 O God please rescue me (Salvaggione) An upbeat paraphrase of Psalm 40. 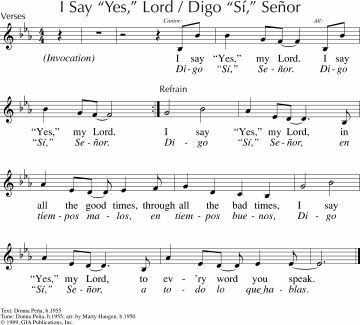 GA445 / G(II)421 / GC597 / GC(II)581 / G(3)676 I Say "Yes," Lord / Digo "Sí," Señor (Pena) A simple song which speaks of sticking with God through good times and bad. Lyrics and sample sheet music. Sound sample. CH541 Lord I pray if today (Keegstra-DeBoer) Very simple words, quite childlike, but memorable. TiS 23 O Lord do not withold your mercy (Saliers) A really lovely and simple refrain. ATW 480 On the day I called (Farrell) A simple song. Taizé / CH276 / VU22 / GtG090 / ELW262 / GA283 / A&M053 / G(II)256 / GC332 / GC(II)340 / G(3)406 / CP094 / W&R166 / PfAS037B / SP28 / URW396 / Lau088 Wait for the Lord (Berthier) Wait for the Lord whose day is near, wait for the Lord, keep watch, take heart. A lovely simple Taize chant; some sources have cantor lines, and some older sources are not inclusive. Sheet music, translations and sound samples. NCH565 / LBW408 / ELW678 / GtG716 / PH422 / CP601 / W&R572 / Cha606 / URW091 God whose giving knows no ending (Edwards) Excellent more formal words of thanks for God's many good gifts to us. Can be sung to a range of tunes including BEACH SPRING, HYFRYDOL, AUSTRIAN HYMN, RUSTINGTON. Lyrics. New words to old tunes. Words of greeting. Not lacking in spiritual gifts as you wait for Christ. AoVK-28 / ATOK 376 Faith hope and love (Watts) This is so easy, and so cool. If you have some groovy musicians, this can even be a very funky rock song. Very easy, and great for kids and non-readers. ATFG514 Emmanuel Carol / God of light we are waiting for you (Berberick) This is a lovely song; you will need to teach it, but once it's known, it's pretty easy. Fast sound sample. Lyrics (search for "God of light"). If you sang this during Advent, this may be a good opportunity to repeat it. AoVK-58 We wait in hope for the Lord (Ford) Simple acapella round "We wait in hope for the Lord, God is our help and our shield. And so our hearts rejoice, for we trust in God's holy name"
Lamb of God who takes away the sins of the world. The dove’s descent at Christ’s baptism. Simon, Peter and Andrew follow Jesus.See also suggestions from Baptism of Christ (last week). TiS 242 / AHB 183 / AoV1-018 / ATN 27 / CH404 / UMH261 / VU352 / A&M667 / HPP163 / GtG157 / PH302 / G(II)481 / GC708 / GC(II)689 / G(3)796 / CP(E) 468 / W&R118 / Lau765 / StF247 I danced in the morning / Lord of the Dance (Carter / SIMPLE GIFTS). Lyrics and tune sample. “I danced to the fishermen, to James and John….”.You all know this one, right? Good for kids Oldy-but-a-goody. NCH357 / CH680 / G(II)487 / GC680 / GC(II)675 / G(3)774 / Lau425 You are called to tell the story (Duck) Excellent words. The simplest tune would be REGENT SQUARE. Different sources use a range of tunes. New words to old tunes. TiS 589 / AHB 505 / NCH171 / CH509 / UMH398 / VU562 / LBW494 / ELW696 / HPP314 / CP432 / CP(E) 233 / W&R345 / Cha337 / 82Hml-550 Jesus calls us; o'er the tumult (Alexander) Great words. TiS sets it to ST CATHERINE, but it could be sung to other tunes (like STUTTGART) if this is not familiar to your congregation (it’s not hard though). New words to old tunes. *Worldmaking.net O Christ, Lamb of God (Bruxvoort-Colligan) A more modern Agnus Dei, with Christ sharing our weakness. Lyrics and sound sample. *ATAR657 Jesus, lamb of God (Mann) A nice new Agnus Dei. Quite simple to sing. *AoV1-196 / GC171 / GC(II)152 / RS 329 Jesus, Lamb of God (Agnus Dei) from Haugen’s Mass of Creation. One of my favourites, I think. Sound sample and lyrics. GC213 / GC(II)319 / RS 469 / URW414 Jesus Lamb of God from Joncas’ Psallite Mass. Sheet music sample. *GtG603 Lamb of God (Vasile) This is really nice; will need to be taught. A bit jazz-like. Sheet music preview. *TiS 705 / Iona (Common Ground, EoA) / W&R282 / SP320 / StF234 / Lau610 Behold the Lamb of God who takes away the sin (Bell) A simple Agnus Dei. Best if you can manage to get all four parts involved. *Sing Alleluia / Fresh Sounds 041 Jesus Lamb of God (Pulkingham) This is one of my absolute favourite Agnus Deis (what's the plural of Agnus Dei?). A little bit of the tune. Good for kids. 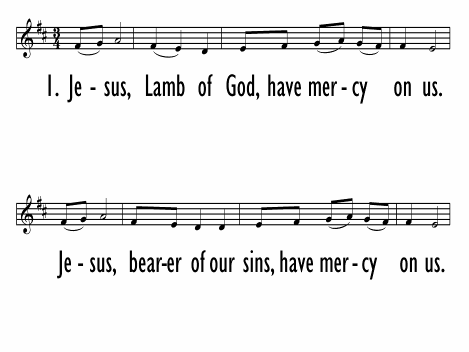 GC(II)174 Jesus Lamb of God (Agnus Dei) (Proulx) A simple chant. Cantor and response. AHB 448 Holy most holy Lamb of God (Niles) Funky Philippino tune. Yeah, something groovy in the AHB! *Music by Heart 06 Lamb of God (McClellan) A simple, and quite lovely call and response. This would be very easy to sing even if new, provided you have a good song leader. Good for kids. CH778 Lamb of God you take away (Gustafsson) A very simple Agnus dei. Easy to sing. *GC(II)318 / G(3)392 O Lamb Of God (Batastini) Quite lovely and soothing call-and-response Agnus Dei. Sound sample. Lead sheet. WoV621 Lamb of God you take away the sin of the world (Haugen) A canon. In 3/4. Seems quite nice and simple. Iona (T1AU) / CH790 O Lamb of God (Bell) Nice; will need to be taught before you use it. The word became a song Jesus Lamb of God (Mann) Quite simple. Good for communion. The plural of dei (which is genitive singular ie 'of God') would be deorum. But I hardly think you would want to write about your favourite agnus deorum or would that be agni deorum,or agni dei? Wot fun! Love what you do. This is the best, Glenys! Perhaps agni dei. Lambs of God, rather than lamb of Gods? But yes, it's a bit silly either way!